Compelling from beginning to end, Paul Greengrass’ Green Zone is not just another Bourne movie. 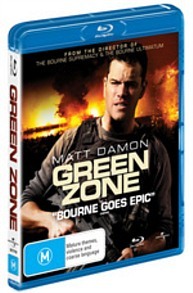 While Matt Damon features as the fighting hero, who questions the very bureaucracy he works for, the greater level of grit and political narrative behind this thriller combines both Greengrass’ keen eye for action and a 2003 Baghdad narrative that provokes thought whilst simultaneously being entertaining. Chief commander of an American WMD search unit, Roy Miller (Damon), is sick of ordering his men into WMD sites in Baghdad that don’t actually contain any of the big bad weapons American intelligence continues to inform him of. As Miller begins to piece together information regarding a source with the alias ‘Magellan’, who is supposedly providing these misleading locations, his mission soon turns from a search for weapons to a search for the truth – why is America really fighting this war? Pushed by a strong story and fast-paced action, Green Zone is shot with the handheld camera edginess that makes the experience intensely realistic and as exciting as Greengrass’ previous Bourne films. With a clear delineation of events that lead Miller from one clue to the next, Green Zone navigates interesting perspectives with clarity and a sense of simplicity that doesn’t take away from the depth and gravity of the argument that WMDs were a fabrication of the Bush administration. Punctuate this with big explosions and snappy gunfire, both visually and sonically suited to the advantages of Blu-Ray viewing, and you’ve got yourself a worthwhile American-war movie experience unlike any other. The efforts and dynamic work of the cast and crew are also given a considerable amount of detail in the special features that come with the Blu-Ray disc. With extensive interviews from director Paul Greengrass and other actors (many of whom were real off-duty Iraq soldiers), especially focusing on Matt Damon’s role in the film, not only provide exclusive insight into the production processes that were undertaken in recreating Baghdad with a strong sense of realism, but also demonstrate the camaraderie that emerged on set. While the film feels a lot more Hollywood in comparison to films such as United 93 and The Hurt Locker, which are in the same vein of action-cross-political-narrative style genre, Green Zone shouldn’t be looked at as a documentary or a movie that tries to push a political agenda. Rather, it is a thriller that does more than just simply entertain with big bombs and over-the-top action – not only in terms of story but also in its direction and execution.